Yesterday I received two emails from two different animal welfare groups taking opposing views on the same topic. 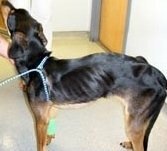 The first came from the Animal Legal Defense Fund (ALDF), and featured a photo of Justin, the 19-pound Doberman found starving and on the brink of death in a foreclosed home. The ALDF was reporting two great pieces of news: First, Justin has recovered, and is now living permanently, happily, with the officer who rescued him. Second, Justin’s Law – the legislation responsible for creating an animal abuser’s registry – is now on the books. And why is that important? A searchable database of convicted animal abusers will now be available to shelters in Suffolk County, NY. Administrators could refuse to adopt out an animals to anyone with a prior cruelty conviction. The second email alerted me to a blog post written by the Humane Society of the U.S. (HSUS) president, Wayne Pacelle. I’m a fan of HSUS. While I don’t agree with every position they take, I believe in their mission. I admire their work to expose and eliminate puppy mills, and I respect the strategic lobbying they’ve done in Washington, especially on behalf of farm animals. A “lesser threat” is a step in the right direction. But what about posing no threat to animals by preventing offenders from ever having one again? If we had all the resources in the world, counseling would be a terrific tack to take. But my interest now is in protecting the innocent, not rehabilitating the guilty. My interest is not in helping convicted sadists reintregrate into society. I’m trying to protect animals from known abusers, and a registry is a great tool in ensuring that protection. Well, ok – I guess no more than someone committed to ending child abuse would check the Megan’s Law registry. But since many, if not most, of us who work in the shelter arena are committed to ending cruelty, it makes sense that we would check such a website before adopting out an animal. Yes, if by “shunning or shaming” means adding their name to a Forbidden to Adopt registry. It does plenty of good for any potential animal that a convicted abuser attempts to acquire. With this I agree. Laws need to be strict, severe, and fully enforced. And I agree that humane education is a crucial aspect to the elimination of abuse. Prevention is best possible outcome. I would like nothing more than to strengthen that bond. But with heinous atrocities occurring every day, there is a more urgent need: preventing suffering. That doesn’t mean we can’t strengthen and educate while we prevent - all are crucial components. My loyalty, first, is to the innocent animals who rely on humans to protect them. And while I’m not against therapy for convicted abusers, I’m not exactly ready to trust a “rehabilitated” Michael Vick with my Pit Bull.